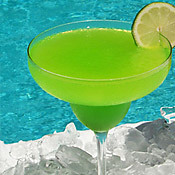 Put a little style in your party with fantastic frozen drinks for your guests. Rent a Frozen Drink Machine from Slushie Spot in Atlanta. 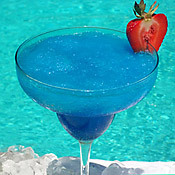 Margaritas, Frozen Daiquiris, Pina Coladas, Blue Hawaiis, All the favorite frozen party mix drinks made easy. Our 1 and 2 bowl countertop drink machines are state-of-the-art modern equipment that delivers frozen fun in half the time of many rental models. Our frozen drink bar mixes taste just like you made it from scratch. The machines deliver a perfect mix that is ready to serve. Once we set you up, you just pull the handle and start serving everyone favorite frozen drinks. No more waiting for blenders to mix drinks, no mess, and an affordable cost too. We have great values in frozen drink machines, bar and cocktail mix, slushie machines and the best tasting selection of healthy fruit filled drink mixes available. area. When you buy your mix from Slushie Spot, the cost of machine is waived for our customers that use our slush machines daily at their place of business. Slushy Spot can make your party, wedding or special event a hit with frozen non-alcoholic fruit slushie drinks or bar mix and cocktail mix frozen favorites like margaritas, strawberry daiquiris, pina coladas, blue hawaiis and more. You provide the alcohol and we bring the rest! and of course calls for your favorite brand of tequila. Salt and lime wedges finish off this favorite for the real margarita affectionados. You can rent a machine from many different places around Atlanta, but with Slushie Spot you can expect to be treated like our only customer. 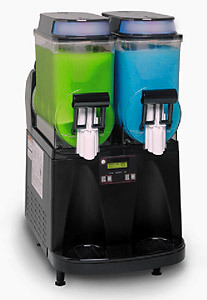 Don't look for the biggest machine rental source, call the BEST frozen drink machine place - Slushie Spot! 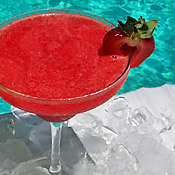 This one is for strawberry lovers, generally mixed with either rum or tequilla and garnished with a strawberry of course! Our Strawberry Mix has fresh strawberry chunks right in it. One sip and you will keep coming back for more! 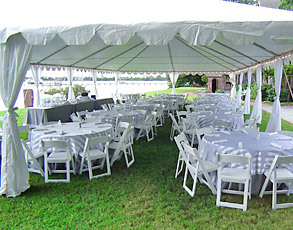 We are a small company that is BIG on customer service and making sure that your party or event goes smoothly. We always deliver and pick-up machines on time. 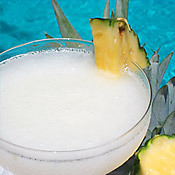 Pineapple and coconut join in this tasty frozen concoction, all you add is the rum and a slice of pineapple to top it off. There are never any surprises with additional costs or inferior machines that may break down, spoiling your event. If you have any questions, even during your party - we are ready to help. You will feel like you are at the Islands when they begin enjoying this drink usually made with rum, it has a mix of coconut and pineapple flavor. Top this one with a cherry, pineapple slice or strawberry. Do you need to add ice to the machine? No, the Slushie Spot Frozen Drink Machine will freeze your mix in as little as 30 minutes depending on indoor/outdoor location and temperature. All you need is a source of power, standard 110-120 volt household power is adequate. Does the machine need a water line? No, you mix the water in with your flavor or drink mix concentrate right in the 5 gallon containment bowl. Once you turn the machine on it will begin the freezing process.